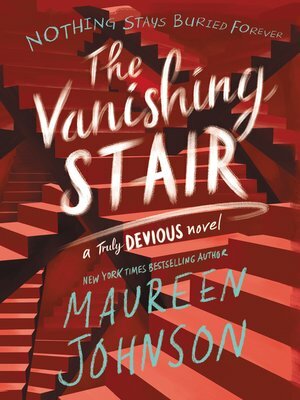 In New York Times bestselling author Maureen Johnson's second novel in the Truly Devious series, there are more twists and turns than Stevie Bell can imagine. No answer is given freely, and someone will pay for the truth with their life. The Truly Devious case—an unsolved kidnapping and triple murder that rocked Ellingham Academy in 1936—has consumed Stevie for years. It's the very reason she came to the academy. But then her classmate was murdered, and her parents quickly pull her out of school. For her safety, they say. She must move past this obsession with crime. Stevie's willing to do anything to get back to Ellingham, be back with her friends, and solve the Truly Devious case. Even if it means making a deal with the despicable Senator Edward King. And when Stevie finally returns, she also returns to David: the guy she kissed, and the guy who lied about his identity—Edward King's son. But larger issues are at play. Where did the murderer hide? What's the meaning of the riddle Albert Ellingham left behind? And what, exactly, is at stake in the Truly Devious affair? The Ellingham case isn't just a piece of history—it's a live wire into the present.